Anaé® is the products range dedicated to the personal wash and hygiene for the whole family with ecological and economical advantages. 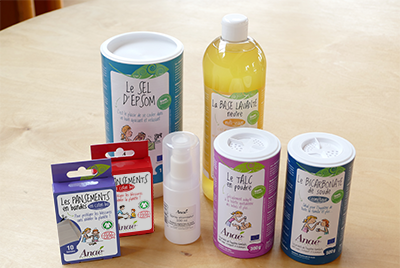 Anaé ressources® is the range of basic ingredients enabling to “do-it-yourself” a lot of hygiene products. – Products are simple, multi-purpose and customizable depending on the mood (essential oils, glycerin…). – Anaé ressources® products are made of natural minerals and vegetal ingredients totally issued from French and organic farming. Cosmetic products are Cosmos organic certified. – Anaé® textile products (reusable cotton pads, massage glove, towel in organic cotton) are GOTS certified to respect environment and people. Additional advantage: a part of the Anaé® luffa is coming from Benin where Ecodis has engaged a solidarity project of agro biology to cultivate the plant producing this vegetal sponge.